Here is an interesting list of African inventors who are actively doing great things on the continent. Athur Lang: A Cameroonian engineer credited for the first medical tablet of Africa that enables cardiovascular examination to be carried out remotely & transmit the results to the surgeons. This has helped save people living in other towns the hassle of having to travel to the major cities. Kodjo Afate Gnikou: a Togolese inventor who has been credit for making the cheapest 3-D printer in the world made out from discarded electronics. His next step is to participate in NASA’s International Space Apps Challenge, a technological initiative to get man to the moon. In his proposal, he has submitted that his printer model enables 3-D printers to be made in any environment using existing equipment. 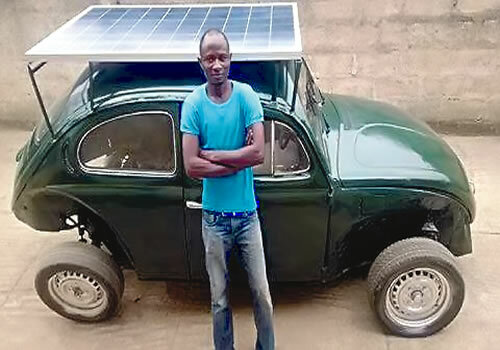 Segun Oyeyiola: A final year student at Obafemi Awolowo University (O.A.U), Segun has captured the imagination of many with his solar powered car. Motivated by his concerns about climate change he set about creating a car that would run on wind and solar energy suited for the African environment. He believes with the right support it will be the future car of Nigeria and Africa at large. Richard Turere: A 13 year old Kenyan whiz kid renowned for creating ‘Lion Lights’, a fence made of solar charged light cells which quickly & effectively scares off lions in cattle rearing towns and villages. Duro-Aina Adebola, Akindele Abiola, Faleke Oluwatoyin & Bello Eniola: Four Nigerian teenagers have come up with a way to use 1 litre of urine to power a small generator that provides 6 hours of electricity. The urine is passed through an electrolytic cell, which separates out the hydrogen which is then passed through a water filter for purification and then into a gas cylinder. The hydrogen is pushed into a power generator to complete the process. Though in need of much refinement & technological advancement it has been hailed as bold step in figuring out how to use bodily waste as a bio fuel. Posted on March 5, 2015 by Adamu Waziri.